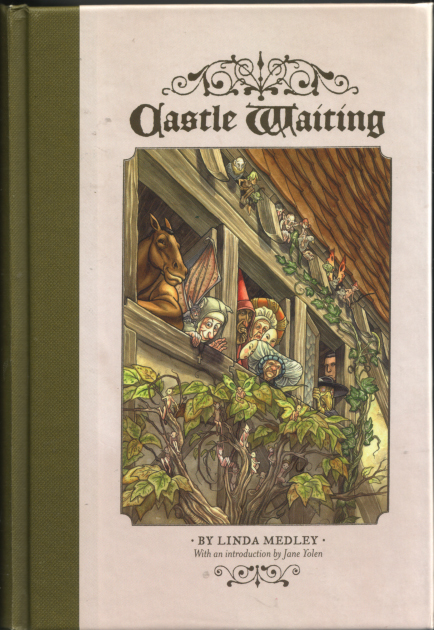 Castle Waiting, by Linda Medley, is a graphic novel of interwoven "nouveau fairy tales" with a supposedly feminist bent. I actually didn't feel they were nearly as feminist as made out to be- but as fairy tales are notoriously not feminist, I can see how these seem very different. The story starts off with a Sleeping Beauty plot line. Beauty isn't too bright, and when she leaves the castle with her prince, with barely a look back at her friends, everyone is stunned. They decide to stay on in the castle and make it a home for those who feel disenfranchised from the rest of the world, including a pregnant woman fleeing an unkind husband, a bearded nun, a horse-headed grand champion and a man mourning the loss of his son. I enjoyed this book. I loved the gentle humor present in every story arc. The characters are all so accepting and kind to each other. They ask no questions, assign no blame, and just spend time together keeping up the castle. My favorite thing about this book was that even though they inhabit the world of fairy tales, these characters do not play in that world. They deal with every day problems and situations, and are more concerned with making everyone feel accepted and loved than with going on quests or killing large beasts. Castle Waiting is about what people who inhabit the fairy world do in their downtime- upkeep the castle, deal with hobgoblins that play pranks, go into town to purchase goods, etc. And it was so fun to be with them for that. What most stood out to me was the lesson of tolerance that Medley weaved through every story. Sadly, we rarely see a story finished completely here, but the glimpses we do get into lives are of people who are different and stick out, but end up feeling happy and satisfied with their lives, regardless. They use their pain and loneliness to accept faults in others and make them feel welcome. It's a good lesson to learn. As alluded to above, I admit that what I disliked about this book was the lack of closure for any of the stories. We learn a lot about the bearded nuns, but we don't know much at all about some of the other castle inhabitants: Lady Jain and her baby, Rackham the steward, the cook and her son, or any of the others. The book ends, but the stories are left incomplete. Luckily, the stories aren't exactly "cliff-hangers." I want to know the resolutions, yes, but I'm not left feeling angry and bitter because the author left me at a very dramatic and climactic moment. Instead, it's more like I've just met someone who I'm certain will be one of my best friends, and I want to get to know her better and spend more time with her, but instead, she tells me that she's moving abroad and I won't see her again for an indeterminate period of time, and so our friendship is on hold. It's a sad feeling, but at least I know that I'll see these friends once more, in Volume II of the series. The idea that this book focuses on characters during everyday downtime is for some reason fascinating to me. Although things don't tie up nicely in the end, I think I would really enjoy this series and am going to have to see if my library carries it. It sounds like something that I would really enjoy, and I am glad that you did too. I loved that you included illustrations in your post as well. Thanks, Aarti! I really enjoyed reading this book a few years ago and I'm glad you did too. There is a second volume that's recently been published. I haven't read it yet. You're killing me, Aarti! Always reminding me of some book or other I WANT to read or NEED to finish or desperately crave to check out of the library. This is one of the 'brary picks. Interesting review, and a push to hurry up and pick it up. Zibilee - I think you'd really like it, too! It's pretty light, enjoyable, happy reading. Vasilly - Yes, I've heard about that one! I didn't see it in the library, or I'd have gotten that one, too. Andi - That's my job ;-) I hope you find and enjoy it! Wow this seems awesome. I mean, fairy tale graphic novel - that would have hooked me. That the focus is on the outskirts, on the day-to-day life... that sounds brilliant. I really like the drawing style and also the writing (smooth lines indeed!). I'm off to look into this one a little more. Oh, I need to read more graphic novels. I guess I'll just add this one to THE LIST. That is an original jumping off point for a retelling of the fairy tale classic - the castle. I love that title. 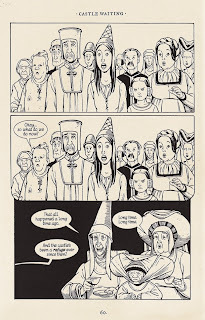 Less enthused over sketches of people within and the graphic novel format itself.